This village is unique to Napa Valley for several reasons. It is in a village that has been declared evil but also presents a bold front of neutrality. The village welcomes combatantants as well as non-combatants and new players to sit and talk and get to know each other. 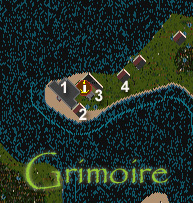 The village officials are usually available in game from 9PM to Midnight PST and almost always available via ICQ.The Village of Grimoire is a combat free zone except for the roof of the Temple of Immortality. If two or more parties decide to enter the Battle Arena for combat they must be in the presence of a Grimoire or ToI official who will judge the contest. All contestants must abide by the rules of engagement or face the consequences. As you can imagine there are many combatants here but non-combatants often come to watch and are more then welcome to enjoy the contests. This is a place where all patrons can mingle and understand each other’s different interests and motivations in Sosaria. This a place for murderers and thieves to visit as well, but they must abide by the village laws. Again, this is a combat free zone designed with enjoyment in mind. There are also Merchant Shops in Grimoire where you can buy those important combat items or craftables. 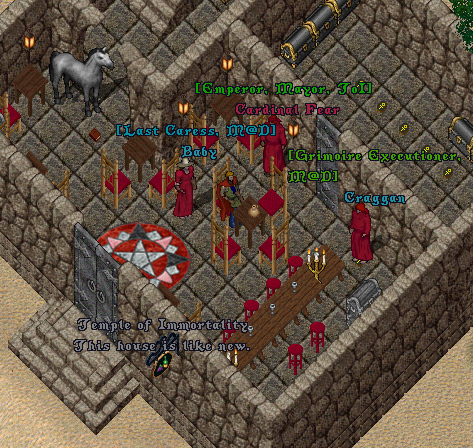 The village also hosts events such as auctions, combat tournaments, and non-combat events. Grimoire can host events for other cities or guilds. If you are in need of a place to run an event to contact the Event Coordinator at Grimoire. There are currently 4 buildings in the village, each can be used for events or a place to stay for people that otherwise would not have anywhere to go.